• Graduated from the National Technical University “KhPI”, Physical engineering faculty (2006), with the speciality «Dynamics and strength». • Graduated from PhD-courses of the National Technical University “KhPI”, on a chamber of Applied Mathematics under scientific guidance of prof. Kurpa L.V. (2006-2009). The subject: «Development of methods and software for investigation of deflection and vibration of the multilayered shallow shells, using R-function theory and spline-approximation». Investigation of static and dynamic behavior of single and multilayered plates and shallow shells of complex plan-forms. Development of algorithms using spline-approximation. Numerical methods of integration inside non-canonical domains. Numerical realization of sparse matrix linear algebra algorithms, sparse matrix storage and processing. Kurpa L.V. Determining eigen frequencies of functionally graded shallow shells using the R-function theory and spline-approximation / L.V. Kurpa, A.A. Osetrov, T.V. Shmatko // Bulletin of National Technical University «KhPI» Series: Mathematical modeling in engineering and technologies. – Kharkiv: NTU «KhPI», 2014. – No 6 (1049). – pp. 99 – 111. Bibliog. : 13 titles. – ISSN 2222-0631. Osetrov A.A. Usage of classical and refined theory for investigation of dynamic characteristics of multilayered shallow shells with a complex plan-form [in Ukrainian] // Informational technologies: science, technique, technologies, education, health: materials of XVII intern. Sci.-pract. conf., 12-14 may 2012 y. Kharkiv. – v. 1. – Kharkiv: NTU “KhPI”, 2012. – p.73. Bezdetko E.O. Usage of RFM to investigate vibration of plates with cuts using polynomial and spline-approximation [in Russian] / E.O. Bezdetko, A.A. Osetrov // Bulletin of National Technical University «KhPI» Series: Dynamics and strength of machines. – Kharkiv: NTU «KhPI», 2010. – No 69. – pp. 18 – 26. Kurpa L.V., Osetrov A.A. Solution of deflection problems of multilayered shallow shells using R-functions method and spline-approximation [in Russian] // Problems of machinery, 2010, V. 13, # 2, pp. 38-50. Osetrov A.A. Application of the R-functions theory and spline-approximation to finding eigen functions as basic ones for meshless discretization of the laminated shallow shells // In Proceedings of the 3rd International Conference “Nonlinear Dynamics – 2010”, sept.,21-24,2010., Kharkov. – P. 377. Osetrov A.A. Usage of variation-structural method and spline-approximation to investigate eigen-frequencies of shallow shells with cuts [in Russian] // Problems of numerical mechanics and strength of constructions, 2010, v. 14, pp. 278-287. Osetrov A.A. The analysis of eigen-forms and eigen-frequencies of multilayered shallow shells of complex plan-form using R-functions theory and spline-approximation [in Russian] // XIII International scientific conference after akad. 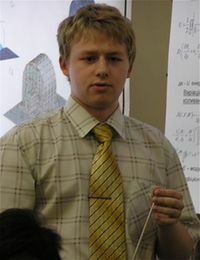 M. Kravchyk. – Kiev, 2010. – p. 206. Osetrov A.A. Usage of RFM and spline-approximation to investigate deflection problems of multilayered shallow shells [in Russian] // Bulletin of National Technical University «KhPI» Series: Dynamics and strength of machines. – Kharkiv: NTU «KhPI», 2008. – No 47. – pp. 151 – 157. Kurpa L., Osetrov A. Application of the R-functions and spline-approximation to the solution of deflection problems of multilayered shallow shells [in Russian] // Modern problems of mechanics and mathematics. – Lvov, 2008. – V.1. – pp. 173-174. L.V. Kurpa, A.A. Osetrov. Study of natural vibrations of shallow shells using. R -functions method and spline-approximation [in Russian] // Math. methods and phys.-mech. fields. 2007. – 50, V. 4. – pp. 83-93. Kurpa L.V., Osetrov A.A. Solution of deflection problem for three-layered plates using R-functions method and spline-approximation [in Ukrainian] // Bulletin of National Technical University «KhPI» Series: Dynamics and strength of machines. – Kharkiv: NTU «KhPI», 2005. – pp. 67 – 72.